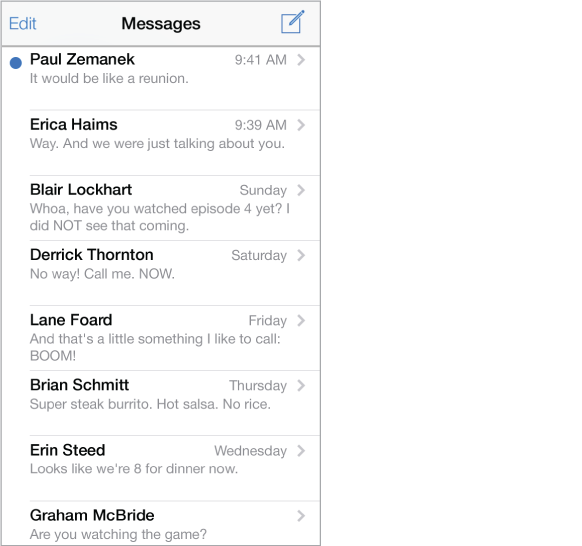 Conversations are saved in the Messages list. A blue dot indicates unread messages. Tap a conversation to view or continue it. View the Messages list. Swipe to the right. Forward a message. Touch and hold a message or attachment, tap More, select additional items if desired, then tap . Delete a message. Touch and hold a message or attachment, tap More, select more if desired, then tap . To delete all text and attachments without deleting the conversation, tap Delete All. Delete a conversation. In the Messages list, swipe the conversation from right to left, then tap Delete. Search conversations. In the Messages list, tap the top of the screen to display the search field, then enter the text you’re looking for. You can also search conversations from the Home screen. See Search.